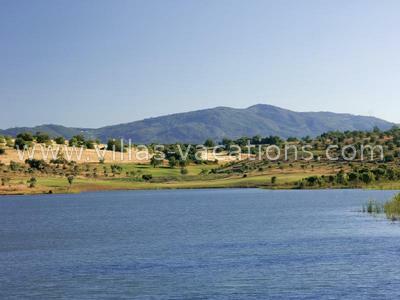 Views over Monchique mountains Characterised by two large lakes and great views of the Monchique mountains, Alamos Golf is the second course to be developed at the Morgados do Reguengo project, north of Portimão. Set beside its sister golf course Morgado in beautiful unspoilt rolling countryside, Alamos Golf Course provides a delightful variety of holes. 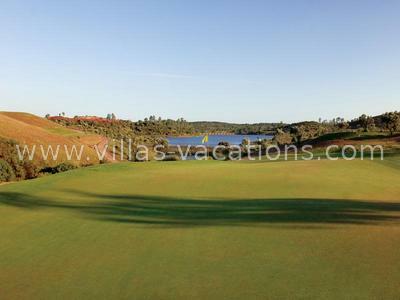 It has some tightly undulating fairways and greens with testing slopes. Whilst the Alamos Golf Course is not as long as Morgado, it has half the number of bunkers. Do not be deceived because it has been cleverly protected with trees coming into play even before you get to the greens! Players accuracy is particularly called upon by the architects retention of as many of the old trees as feasible. These natural obstacles coupled with strategic placed bunkers and occasional water hazards make the course a worthwhile challenge.